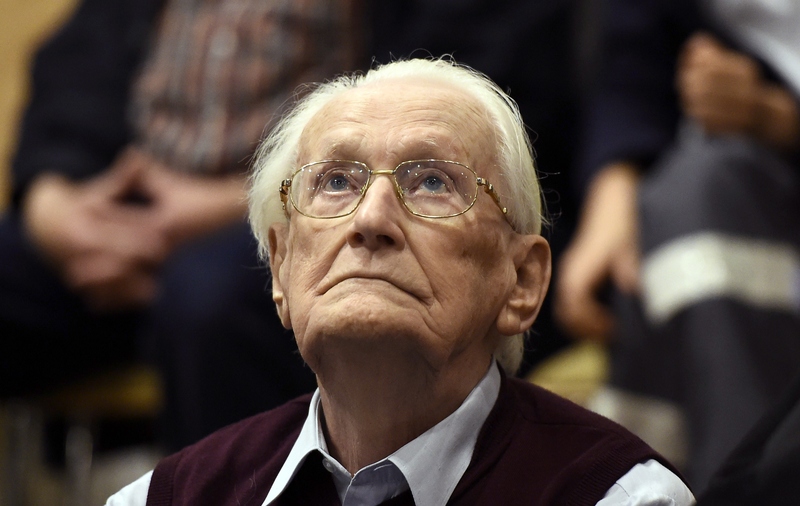 BERLIN -- German prosecutors said Monday they were notified that a former Nazi death camp guard dubbed the "Accountant of Auschwitz" died before he could begin serving his 4-year sentence. Hannover prosecutor Kathrin Soefker said a lawyer informed her office that Oskar Groening, 96, died Friday in a hospital. The office is awaiting an official death certificate, Soefker said. The lawyer, Hans Holtermann, didn't immediately respond to a request for confirmation. Groening's death first was reported Monday by German weekly Der Spiegel. Groening was convicted in Lueneburg in 2015 as an accessory to the murder of 300,000 Jews. The Lueneburg court concluded that although there was no evidence of involvement in a specific killing, Groening knew that Jews were being slaughtered at the German death camp and supported the killings through his actions. Groening testified at his trial that he oversaw the collection of prisoners' belongings at Auschwitz and ensured valuables and cash were separated to be sent to Berlin -- the actions that earned him the "Accountant of Auschwitz" label. He said he witnessed individual atrocities, but did not acknowledge participating in any crimes. All of his appeals were rejected, and it was only his ill health that kept him from being sent to prison in recent years. Most recently, his lawyers made one final bid for clemency, a decision on which still was pending. Efraim Zuroff, the head Nazi hunter for the Simon Wiesenthal Center, said it was unfortunate that Groening's conviction didn't result in "at least symbolic justice" for the victims of Auschwitz. In 2011, former Ohio autoworker John Demjanjuk became the first person convicted in Germany solely for serving as a death camp guard without evidence of being involved in a specific killing. Demjanjuk, who always denied serving at the Sobibor camp, died before his appeal could be heard. In 2016, former SS sergeant Reinhold Hanning was convicted on 170,000 counts of accessory to murder for serving as an Auschwitz guard. He, too, died before he could begin serving his 5-year-sentence. Hanning apologized for his wartime service, telling Holocaust survivors that "it disturbs me deeply" to have been a part of the Nazis' genocidal machinery.